Wylie Recreation: Spring Break Camps! What are your kids doing for Spring Break? 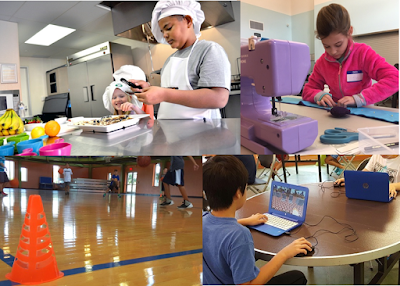 Don’t miss out on the exciting camps that will keep their mind and body busy all week! Minecraft Architects - Start crafting with Minecraft! Spark creative thinking, develop spatial visualization skills, and inspire programming proficiency. Work with a group to create building structures to meet specific guidelines. Defeat the challenges of limited resources, time limits, and environmental features. Discover drawing blueprints and then transform the sketch in Minecraft. Cooking Camp - Be the next Executive Chef! Learn about kitchen and food safety, preparation, and international foods. Work with incredible ingredients and fun equipment to create a variety of delicious dishes from around the world. Enjoy eating the delicious treats you prepared at the end of each class. $25 supply fee payable to instructor at the first class. Garden Sewing Party - Sew what? Learn about sewing machines, thread, fabric, seams, and bobbins. Enhance fine motor skills, boost reading comprehension, and apply math while making a skirt, tote bag, flower throw pillow, and embellishing a shirt. Snacks included. $45 supply fee payable to instructor at the first class. Bring sewing machine; a few available upon request. Total Sports & MVP Challenge - The next all-around athlete is you! Develop strength and fitness while having fun. Improve motor skills, hand-eye coordination, and endurance while learning about proper nutrition and the rules of sports. Cross-train using obstacle courses, dodgeball, soccer, basketball, and other exciting agility games. Wear athletic clothes and tennis shoes.